A new short from Kalyanee Mam, the Sundance Grand Jury Prize winner for Feature Documentary. As Singapore dredges sand out from beneath Cambodia’s mangrove forests, an ecosystem, a communal way of life, and one woman’s relationship to her beloved home are faced with the threat of erasure. Full of haunting imagery, and anchored by an intense, yet charismatic, performance of simmering rage from its main subject, Lost World is technically an “issue doc”, but I hesitate to use that phrase due to the negative connotations that surround it. No less powerful or thoughtfully constructed than the best scripted dramas, Kalyanee Mam’s film encompasses vast juxtapositions in a slow-motion lament against environmental degradation, loss, and rapacious capitalism. It is, to my mind, a masterclass of the doc-form, and my favorite short of this young year so far. The film opens with aerial photography—distant overhead drone shots capture an alien process. Giant excavators dredge huge quantities of sand from the under the water then deposit it in barges. Something as simple as this expository montage hides layers of meaning that set the stage however. The overhead angle induces a feeling of estrangement for the viewer, the patterns producing an affect akin to a Burtynsky work. This is abnormal. Simultaneously, the distance of the shots connects to the setting, establishing a sense of place as we more fully take in the landscape, but also connect to the enormity of the project—invoking the massive scale of the theft. We return to the drone footage throughout the short, it serves a delineator between thematic chapters. 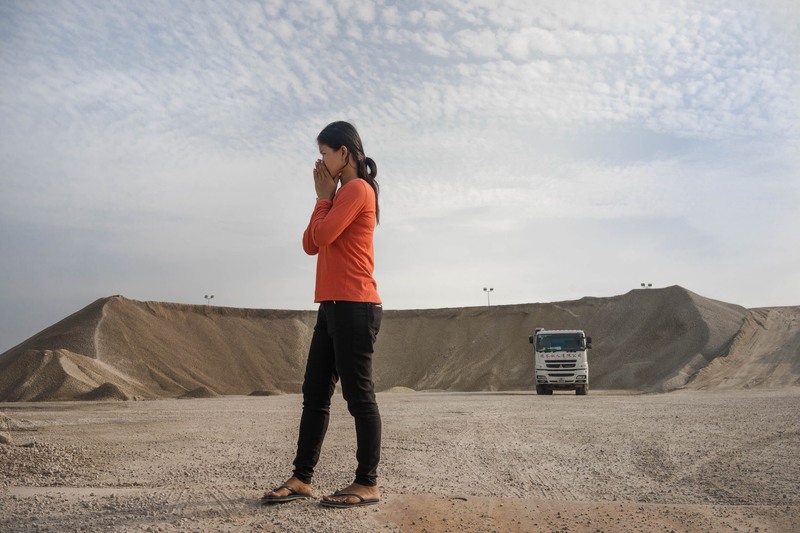 Accompanying us as well throughout is Phalla Vy, a young Cambodian woman whom serves as guide for what is happening to her home of Koh Sralau, a tiny island where fishing and crabbing is a way of life—activities that are threatened by Singapore’s confiscation of Cambodian earth. The first chapter introduces the issue—the barges, the large facilities that hold the accumulated sand. Phalla Vy stands in their midst, wonder and horror showcasing on her face in equal measure. The second chapter delves into life on Koh Sralau. In a simple, observational way, we see the people and the way of life that is threatened. Poetic images like a girl snatching a snail off of a leaf, or the ritual of old women shelling crab in a circle, contribute to a portrait of a community, and we receive testament that the changing ecological conditions are disrupting the aquatic life that the village relies on. Phalla Vy is an engaging subject. Young and pretty, she is restrained in manner, but the fire of indignation emanates outwards. While not explored in-depth, you get the feeling that you’re watching a fierce activist’s origin story. Mam is attuned to her, and alongside her editor, S/W alum Adam Loften, knows when to hold a shot that extra second to accentuate Vy’s alternately dark or despairing moods. Still, after 2 chapters, the film verges on repetition and threatens to lose steam. Then the third chapter arrives however, and is so wonderfully conceived; darkly humorous, but thematically poignant, that it not only rescues the film from its threatened lull, but elevates the whole. I was so surprised and affected by it that I don’t wish to say any more, and instead encourage you to simply see it for yourself. The film comes to us via Go Project, the production company of frequent S/W-featured filmmaker Emmanuel Vaughn-Lee, who serves as producer. It premiered on Emergence Magazine a few months ago, but escaped our notice until Vaughn-Lee reached out to us recently, and we’re glad he did. I was not familiar with Mam’s work before her breakthrough feature A River Changes Course won Sundance in 2013, and to my shame did not followup and watch the film afterwards. What Lost World teaches me however is that the acclaim she has received (including a coveted MacArthur grant) is no fluke—Mam “gets” documentary filmmaking on a deep level. She has the dedication and empathy to embed deeply in communities over long periods of time to gain familiarity and trust, and possesses the ability to communicate sophisticated ideas visually, both with what she shows and what she withholds. Furthermore she knows how to construct feeling, both in eliciting it from her subjects, but also producing it via her final arrangement. I’m wildly impressed, and eager to see more. Fortunately more is on the way—Mam is currently in Cambodia working on a followup to A River Changes, titled Fire and the Birds Nest.